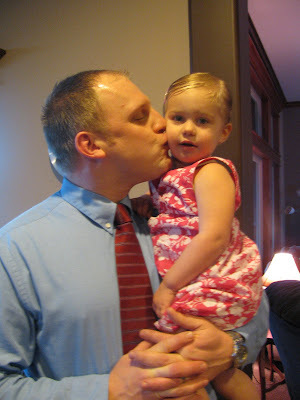 The Krehbiel Krew: I'm two!!! 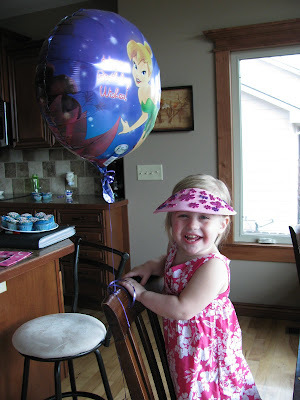 Lilah brought Eva a Tinkerbell balloon when she came over for our daycare party. Eva LOVED it..and had to take it everywhere with her. We even had to tie it to the back of her chair when she ate lunch. 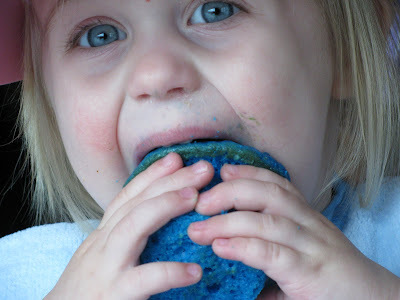 Eating the cupcake...in record time!!! 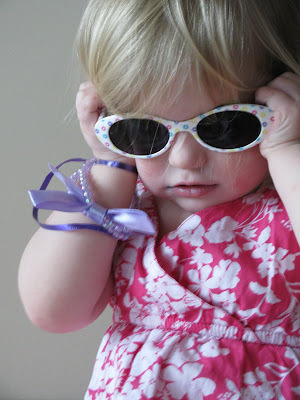 Eva in her new shades.. of course, this stubborn little girl has to put them on all by herself. Miss Independent!! On Saturday we had the family birthday party. 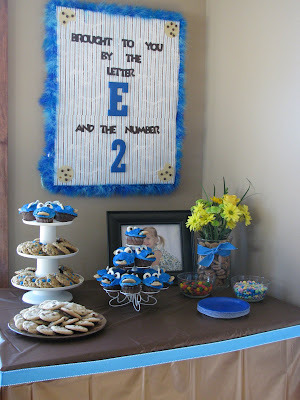 It was a Cookie Monster themed party. If you didn't already know, this little girl is a just a little obsessed with cookies. She sleeps on a chocolate chip cookie pillow case for pete sake!! 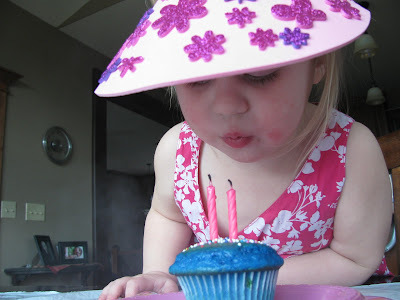 Eva's face lit up when she saw the table with all the cookies and cookie monster cupcakes. I think everyone had a good time... I know the kids did!! The only thing that would have made the day better would have been a K-State victory.....darn Wildcats!! 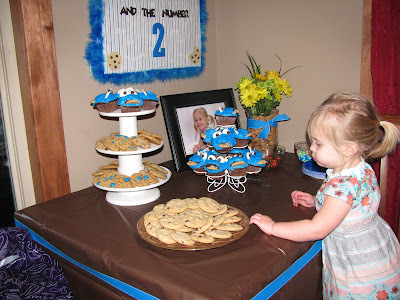 The Cookie Monster spread....everything turned out pretty good! I was a little disappointed in the way my cupcakes turned out. They looked more like fish than cookie monster... LOL! BUT...the first thing Eva said when she saw them was "cookie monster!!" so, I guess it was a success :) If you look on the bottom left corner of the sign behind then table you will see that 2 chocolate chip are missing from the cookies. Yes, I used real chocolate chips for that..and yes, Eva ate two of them after I hung up the poster. Silly girl!! Here is Eva looking over her table. She is probably thinking "oh, I don't know where to start first!!" She is such a sweets girl. I wonder where she gets that from?? I didn't really get any good pictures during the party.. . :( I kinda forgot for a while....then when I realized I hadn't taken any pictures yet, it was too late. BAD MOMMY!!! 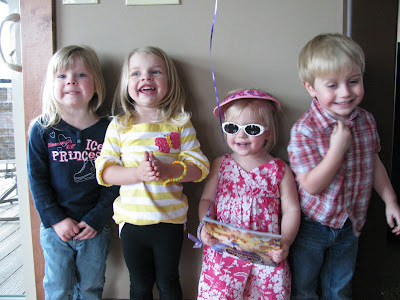 Aunt Kylie posted some cute pictures on her blog from the party.. Thanks Kylie!! Cute cute cute Jenny!! It looks fantastic and all the sweets look delicious! :) Nice job and happy birthday to your soon to be middle child! The cupcakes look awesome! 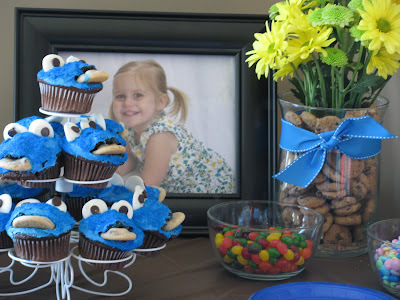 What a cute party for your little cookie monster!